It always amuses me that Chinese are so proud of their “strong” currency of recent years. The main reason is that their currency is actually pretty darn stable. It’s also that the increase since 2008 has been dwarfed by other currencies, particularly the Australian dollar. In November 2008 it was 60 cents USD. Now it is more or less $1.05 USD. That’s a 75% gain for those without a calculator. Many have predicted a fall for the last 18 months, but the Aussie, as it is called, has stubbornly resisted. Has the most volatile major currency has suddenly become a source of stability? When will it end though? 2008 saw a tremendous fall in the Aussie after all. 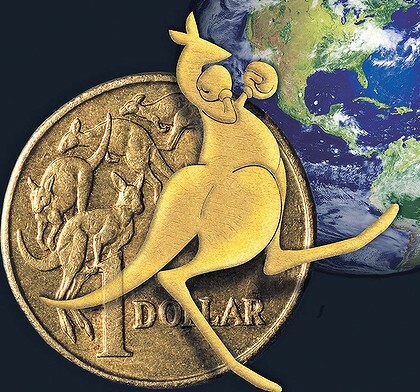 What are the different theories for the Aussie dollar, now the world’s 6th most heavily traded currency, and what can that tell us about the future? 1. The Theory: It’s all commodity prices. The Reality: If lower commodity prices will equal a lower Aussie dollar, 2012 didn’t really help that much. Iron Ore represents about 25% of Australian exports, so it sounds plausible. Actually, Iron Ore prices fell from about $160 per ton to around $90 per ton during the last year and other commodities like copper eased also. The Aussie dollar did wobble but quickly returned to previous levels. The Verdict: No real sustainable impact. 2. 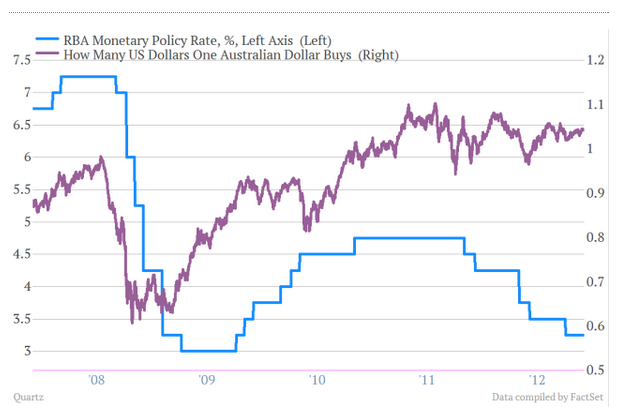 The Theory: The Aussie dollar is a play on the world economy. The reality: Expectations of a weak world economy means a weak Australian dollar (this time expected future commodity prices). The world economy has continued to soften in 2012 with most of Europe in recession or very close by and next year the forecasts seem no better. With only the US, Japan and Canada amongst rich countries expected to exceed 1% growth next year and emerging economies like Brazil, China and India all moving through a slower patch, the future isn’t forecast to be blindingly bright either. 3. The Theory: It’s the carry trade. The reality: The carry trade is the investment strategy of borrowing money in low interest countries (like Japan, US) and buying high interest currencies (like the AUD, NZD). This worked well when the Australian dollar could achieve a 5% interest rate in a bank deposit yet borrowing costs were 1% or less in the US and Japan. Lower interest rates should lead the currency lower, but the last 12 months this hasn’t been the case, as the graph shows. This doesn’t mean the effect has gone; perhaps it is just delayed and will return when the interest rate gap drops to within 2% of the major borrowing currencies like the USD and Japanese Yen. The Verdict: It doesn’t appear to be unwinding, at least not yet. 4. The Theory: Currencies reflect future growth expectations. The reality: Future growth expectations have in fact declined in recent times. This is after all why interest rates have been reduced by the Australian Reserve Bank. The Verdict: No recent role that we can see. 5. The Theory: The AUD is a new world “Reserve” Currency. This is a new theory is essentially that Australia is part of the new group of countries and currencies offering protection from excessive levels of government debt. Blackrock calls it CASSH economies. It’s an interesting theory that Australia is now a core Reserve currency of the world’s central banks. It’s the sole theory in our list that isn’t disproved by the facts over the last 12 months. The Verdict: The evidence this year has been supportive and the longer the Aussie stays strong, the more evidence is accumulated. So, a new “reserve” currency? Still, we worry that the amount of cash from other central banks is too much for the small Australian government debt market (around $280 Billion USD based on our back of the envelope calculations). Given that China, just by itself, has a cash pile of about $1.8 trillion USD there isn’t nearly enough high quality debt to go around. Don’t forget Japan, Dubai, Saudi, Norway and Singapore all have their sovereign wealth funds, which is completely forgetting the developed world’s central banks. If the government debt market isn’t big enough, the money could end up elsewhere. At best we may see structurally lower interest rates for Australia with restrained lending. At worst, a lot of the money will end up outside government debt, like in the banks and even further afield chasing return/yield. This might lead to excessive investment, higher inflation and in particular lending growth leading to nasty asset bubbles that arise as this cash flows in. This is one effect of a “reserve” currency that we hope Australia doesn’t mimic the United States and its disastrous housing bubble/burst of 2004-09.